New Kd prediction server for PDB files Go! 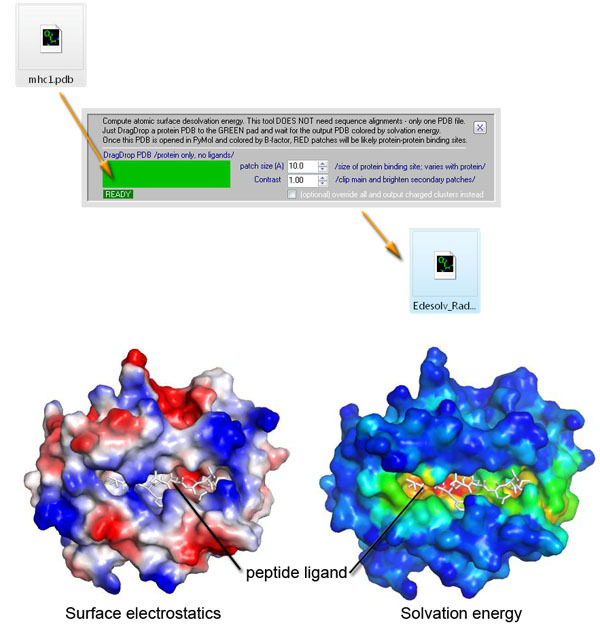 SEQMOL is a PDB structure analysis suite. 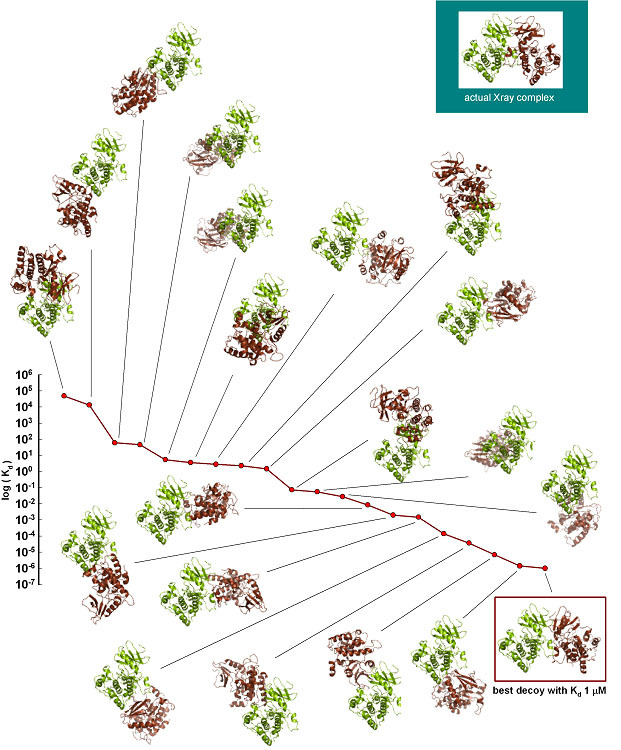 thereof) and to map these features onto PDB files. PDB coordinates to yield insights that could often be valuable. application. Kd along with a comprehensive interface analysis is produced in the output. batch PDB processing is done automatically if more than one PDB was DragDropped. interfaces are real and biologically important and which are not. Unfortunately, measuring individual Kd of crystal interfaces is not possible. to tell non-specific crystal packing contacts from true interfaces. some weak crystal contacts are extensive and appear stable. 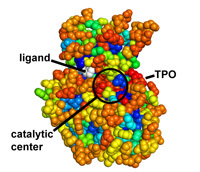 Picture above is crystal packing of one of CDK2 kinase complexes. Two rather large kinase-kinase interfaces can be seen in the structure. Both interfaces are somewhat unstable (Kd ~ 1-10 uM); IF1 is more stable. favorable solvation energy (yet weaker Kd!). for designing mutations for testing the interfaces. SH3 domain of Abl kinase (PDB ID 1abo). 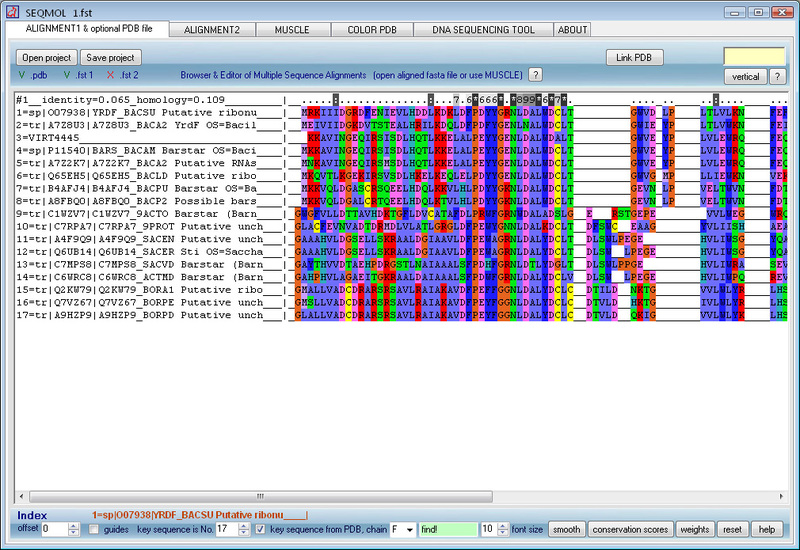 This domain binds a proline-rich peptide APTMPPPLPP. 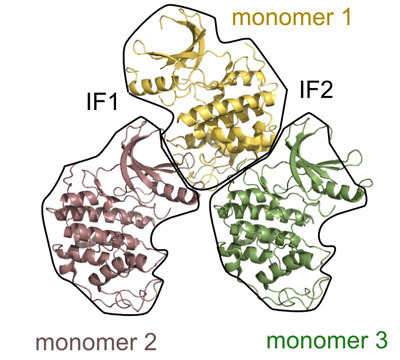 the monomer thus correctly shows the location of a strong protein binding site. Surface colored by per-atom solvation energy. Note the red "hot spot". For comparison: this surface is colored by conventional "hydrophobicity" of residues (W, F, Y, A, L, V, I etc are more blue, D, E, N, Q, R, K, S, T etc are more red). The "hot spot" is not obvious. Nucleic acid desolvation analysis example. 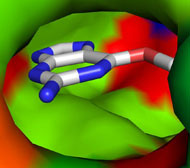 Surface electrostatics (blue-red) vs RNA binding patch energy (SRP PDB ID 1QZW). 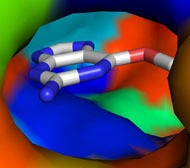 surface electrostatics commonly used to evaluate RNA binding sites is ambigous. 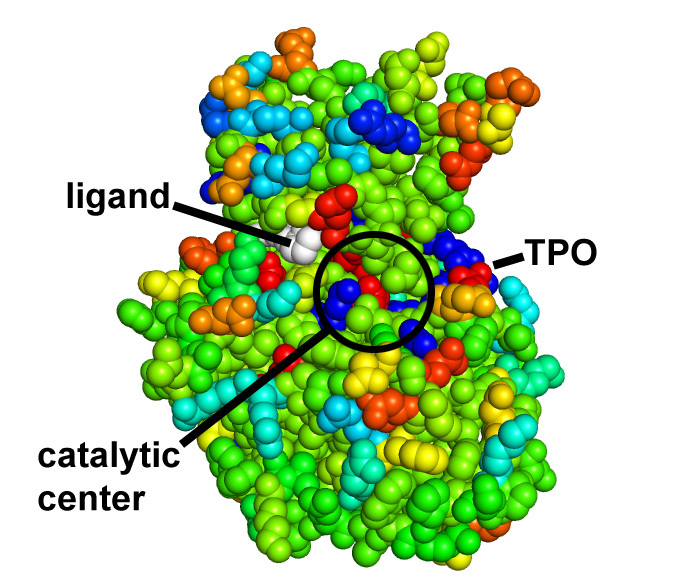 PDB-based calculation of surface burial, electrostatic energy and solvation energy for proteins and nucleic acids and protein-protein protein-RNA and protein-DNA complexes. 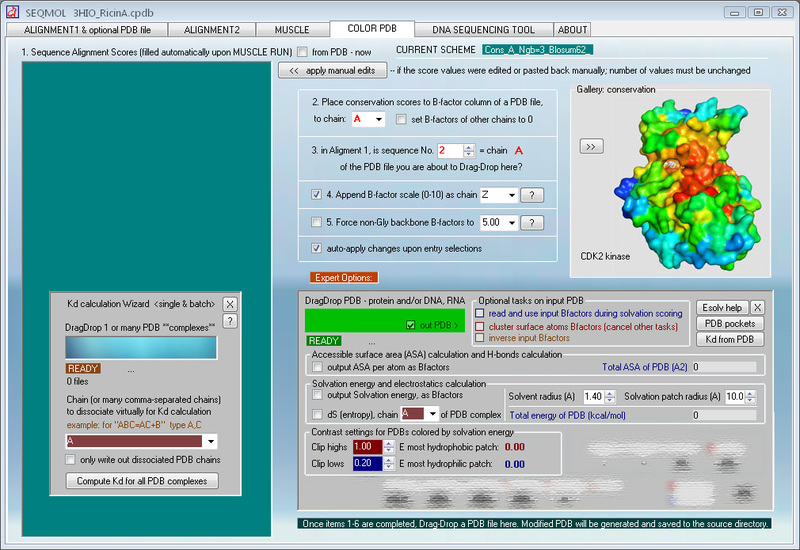 The program's output is both, quantitative (a single whole-PDB value) and qualitative (PDB surface is colored by scaled per-atom values). 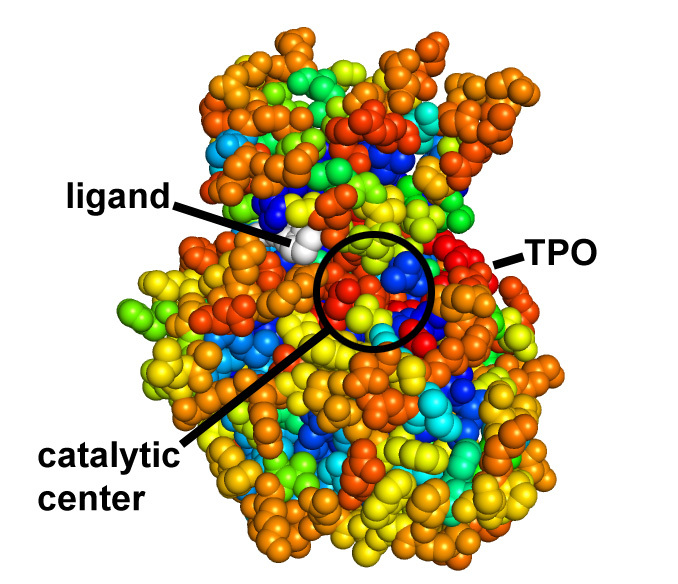 One unplanned but useful appliation of this module is to find pockets in PDB structures by clustering solvent-exposed atoms (read built-in help for explanations). 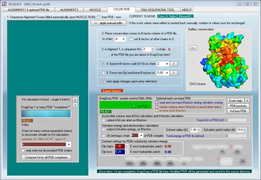 A dedicated module in SEQMOL can calculate binding free energy (at 1-molar reference state and 25 oC) and binding constants for protein-protein and *possibly* protein-(RNA/DNA) complexes (this method was developed explicitly for protein-protein interactions but seems to give relevant numbers for some protein-RNA complexes). The goal of SEQMOL is to not just predict trends in binding energy, but to predict as closely as possible real Kd values one would measure in a lab. 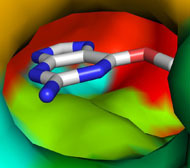 The procedure is fully automated and only calls for DragDropping a PDB and selecting chain/chains for virtual dissociation and Kd measurement. Accuracy** disclaimer: in some cases binding constants may be off from the real values by orders of magnitude. However, more frequently than not, they are correct. 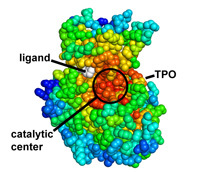 For example, for 45 out of 59 examined complexes (76%) from the PDB database, computed binding constants were within 2.5 kcal/mol from the experimental values throughout the Kd range from subpicomoles to millimoles, and protein size range from short peptides to large proteins over 50 kD. Deviations in SEQMOL Kd may arise from several reasons: from assumptions in the code, from the fact that binding constants depend on the reaction temperature and buffers (pH, salt concentration), which differ between published Kd, whereas SEQMOL always reports a value projected for an "average" ideal buffer and standard conditions. 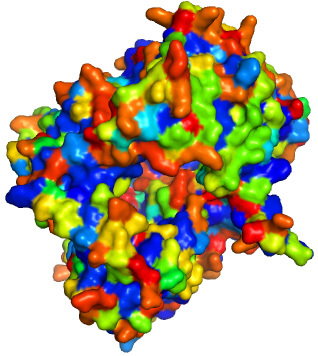 Many PDB structures are solved at resolutions that do not allow to unmabiguously place some rotamers (HIS, ASN, GLN), resulting in PDB coordinate errors which also contribute to the calculation vs experiment scatter. "Are scoring functions in protein-protein docking ready to predict interactomes? 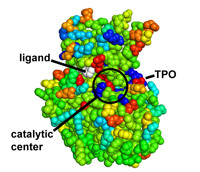 Clues from a novel binding affinity benchmark." 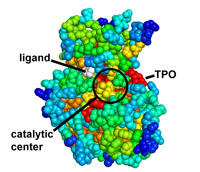 Proteins crystallize forming several protein-protein interfaces in the crystal. Distinguishing true interfaces and crystallographic interfaces presents a challenge. 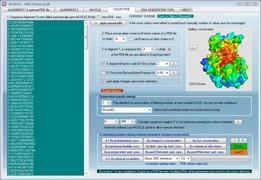 With SEQMOL, it is possible to compute Kd for all observed protein-protein contacts in the crystal and obtain a good measure of the interface stability along with realistic Kds for their formation. This method is greatly superior to guesses based on surface conservation or accesible surface area (ASA burial), see the table above. 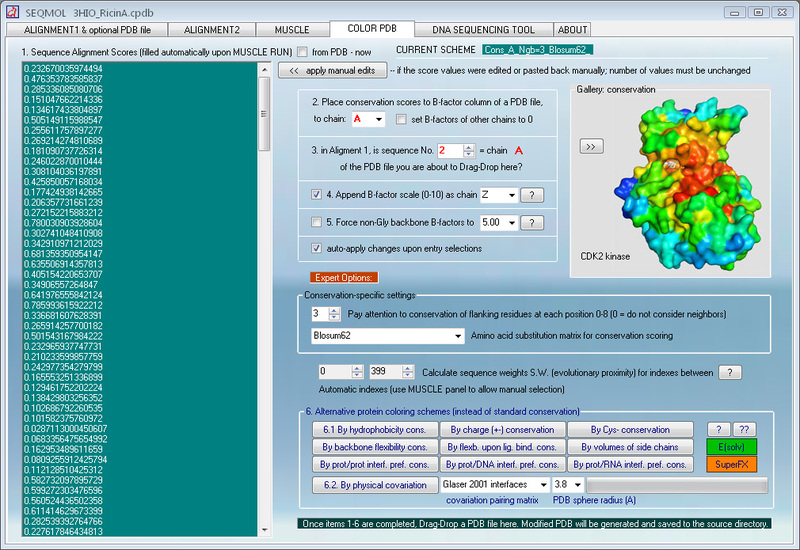 SEQMOL-Kd hosts a utility for one-click generation of PDBs with ALA-scans of any interfaces of choice. 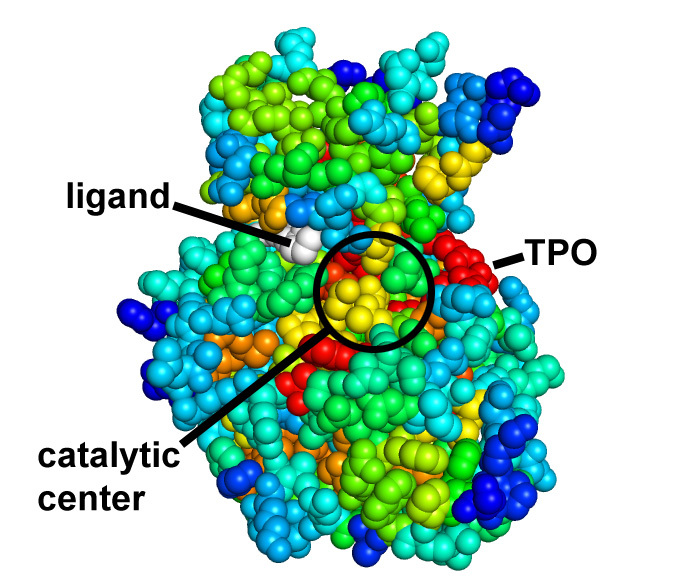 "Hot spot" residues can be identified by a large effect on the binding free energy of the resulting ALA-permuted PDBs. 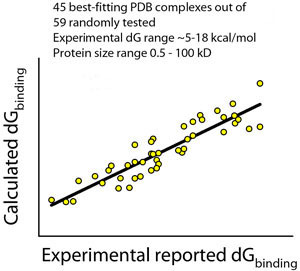 Another appliction of the Kd prediction module is to filter results of protein-protein docking programs. 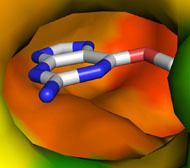 In the test example below, two monomers of a known protein complex were randomly oriented in 3D space. Then they were docked back using Hex 6.0 docking utility. The docking run produced 500 solutions, top 20 of which had energy range from -560 to -470 "Hex units". (with similar docking scores) it was possible to identify very unstable and very stable solutions. In this example the most stable complex, as ranked by SEQMOL, was also the near-native one. Many of the methods used in SEQMOL have been published by different and truly great authors. methods are new and have not been published in peer-reviewed journals yet. They will be one day. 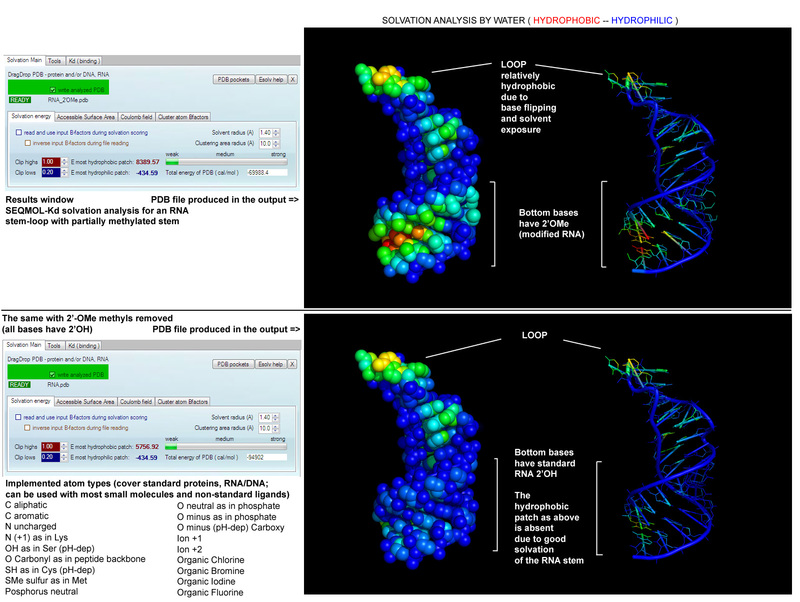 often do well at extractintg information from protein sequences and PDB structures. Many features will work as is, some will require licensing. Kd module, RNA binding sites module and Solvation module work on subscription basis. conformational flexibility to predict rigid and dynamic parts. using "5.1 Force backbone B-factors to" option. if all backbone atoms have a neutral B-factor of 5.00. 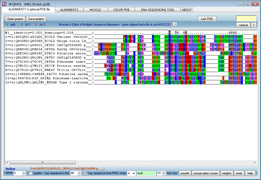 - More convenient DNA sequencing tool. the PDB file according to this score. In case of runtime errors during execution in Windows Vista or Windows 7 make sure that the program is not hampered by the Windows UAC. It is recommended to either disable UAC altogether or to ensure that SEQMOL is always launched with the option "Run as administrator"